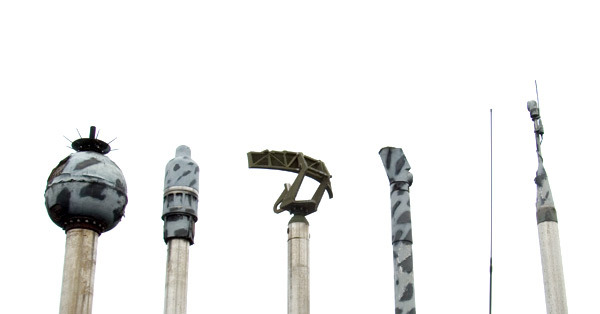 From the camo, I'm guessing that they're the periscopes of a U-boat, but I have no idea what they all do. Good guess  they're the masts protruding from submarine HMAS Onslow's conning tower here in Sydney. From left to right: snorkel intake, ESM mast, radar, search periscope, and attack periscope. Can you legally (and safely?) fly in Australia, given your training the U.S.? Is it possible and/or expensive? As far as I know I can fly a US-registered plane in Australia (if I can find one to rent), and it used to be possible to do a BFR-like thing and get a temporary Australian license if you have a US license, which then allowed you to rent and fly normal Australian-registered planes (which is what I did a few years ago). Can you provide a link to your blog entry when you flew in Australia a few years ago? Flying in Australia seems fascinating because of the sameness of the terrain. Before GPS, that must have been intense. I came across this entry and saw your comment about the ASIC. I did some Australian flying in 2007 as an American pilot before I moved here full-time, and I ended up getting an ASIC because I was (inconsistently but generally persuasively) told that I needed one. My tour diary has more details for foreign pilots interested in flying down under. "Phik" -- thanks! I enjoyed your diary immensely... like you I got conflicting reports about the whole ASIC thing, and, frankly, I didn't have time to sort it out this time. Next time, though, I may try it properly -- I have actually flown as dual PIC in Oz a bunch of years ago out of Bankstown, which was fun, but that was well before the whole ASIC thing came in. It was quite odd not having an accent on air :-).